The Cottage is very comfortable and enchanting. It sleeps 2/3. Quirky stable front door greets you. Accommodation comprises fully equipped kitchen, a comfortable lounge and relaxing dining area. Free high speed WiFi, smart TV with complimentary Netflix. The kitchen window in particular enjoys views of St Michael's Mount. There is a Double Bedroom with enough room for a Cot if required: Travel Cot supplied free of charge. The bedroom has a Queen-size bed (5 ft) and is very comfortable. A single occasional Z-bed is available for use in the lounge. There is a luxury bathroom with bath, shower and underfloor heating. The Cottage is centrally heated and has an advanced ventilation system. Welcome Pack on arrival; all home comforts including iron and board provided! There is a large, mature garden with Cornish palms, colourful flowers and a relaxing pond. There are plenty of benches outside and in the summerhouse there are loungers and a barbeque . Wonderful rural and coast views. The Old Primary School was built in approx. 1875 and is a fine example of a Victorian school house. It was converted for holiday accommodation in 2000 and the décor, facilities and services have been updated regularly. Both the Cottage and Apartment have dedicated private parking and private entrances. There is separate wi-fi networks for each property, which are both strong and fast. Each property enjoys fantastic views and there is a very large shared garden with picnic tables, bbq, loungers and other amenities. Guests remark on the great location of the accommodation, with easy access to all the spectacular sights around the area. The building stands alone and surrounded by fields, but is only 200m from the village. The village is very picturesque and has an old Norman church and the village pub serves very good food and drink. Approximately 800m down the road is the village of Crowlas which has a convenience store and pub. All bedding and towels are provided, and the kitchens are well fitted out. Stacey and Steve have provided just about everything you would need for a great stay. Family- run, friendly small business. Operating since the year 2000. . The atmosphere of the area ... Very relaxing and quiet location (nestled between 2 fields, opposite allotments), views of the sea and surrounding countryside. Convenient for A30 which means that everywhere in West Cornwall is on the doorstep ie St Ives, Penzance, Marazions and all the lovely little villages.. Near to so may lovely places! You can see St Michael's Mount from the house and village, The Welcoming feel feel of the accomodation .. Our previous guests comment that our accomodation is like a 'home from home' because we like to think we have thought of everythng you need during your stay ie Welcome Pack of local paper, bicuits tea, coffee, milk, flowers all kitchen requirements including flowers, washing up liquid, kitchen towels etc. Idyllic... We welcome couples, singles and families, buisness people. All are welcome, all want to come back. Former Village Primary School. History of the School enclosed in Information Pack. The bathroom has recently been renovated. It has been beautifully tiled and benefits from under-floor heating. There is a bath and powerful shower. It has a heated towel rail. Complete with toilet and sink. Free WiFi. in Cottage. Electricity and hot water supplied free of charge. We like to think we supply everything you need for your holiday. In fact we are often described as a ' home from home' . For example all bedding, towels (they are changed mid-week for weekly bookings). We have a Welcome Pack on arrival - tea, coffee, sugar, milk, local paper, flowers. In the kitchen we supply everything you need to cook and serve up food ie cooking implements, plates , knives forks etc. In addition we supply washing up liquid, handwash, kitchen roll, cloths, foil etc. We have a recycling bin. We supply toilet tissues. We are so committed to making our guests comfortable, we ask our guests if they can think of anything we've missed out . One of the best properties we have stayed in. Well appointed everything as you expect from a holiday cottage. The Old Primary School is very centrally located to explore Cornwall. Views of St Michael’s Mount from the kitchen window are stunning. The cottage had everything we needed to make our stay extremely comfortable, and the little extras, flowers, chocolate biscuits & local paper, were a pleasant surprise. Beautiful views over the village and towards St Michaels Mount. Very well positioned and provided great access to St Ives, Penzance, Portleven, Lands end and the Lizard to name but a few. The cottage is extremely well equipped and we were not wanting for anything. The cottage was very well furnished and comfortable, making it a very cosy home from home. Stacey and Steve had been thoughtful in leaving lots of helpful information and tips available. The location of the cottage was ideal and we had great days out to St Ives, St Agnes, Penzance, Mousehole, Bodmin etc. I'd highly recommend. The propert is perfect in every way. Spotlessly clean and excellent location. Spent a week in this outstanding little cottage. Sitting with the door open late into the evening with magnificent views, what more can you ask for. The cottage has everything you need and is in an ideal location. We thought a visit to this area would be a one off as it's a long drive for us but we enjoyed it so much we can't wait to go again next year. Great location. Excellent property, Property as described. Only minor niggle could do with a mixer tap in the bathroom sink. Our APARTMENT & COTTAGE are part of a former school in Ludgvan, which is 5 miles from St Ives, 2 miles from Penzance and 1 mile from Marazion. They are located in an idyllic and peaceful village with granite cottages,a real ale pub with great food and a14th century church. 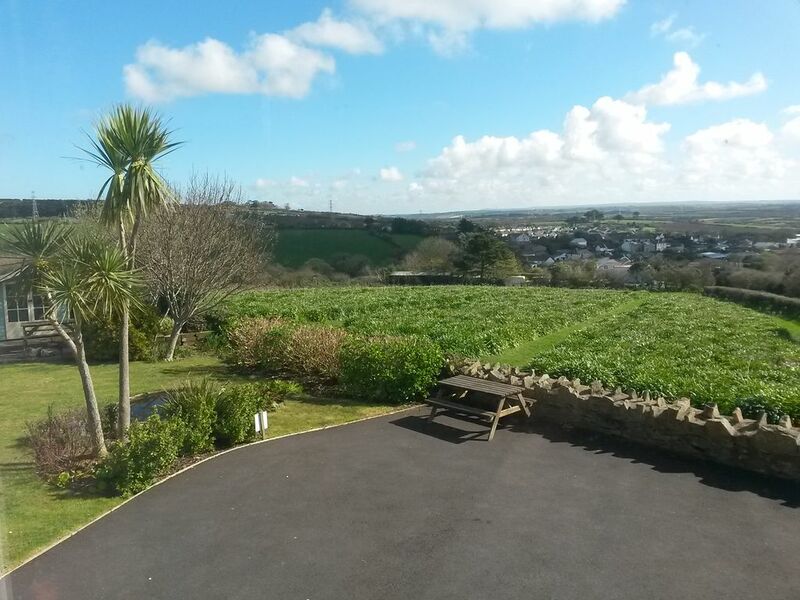 The properties are surrounded by fields and enjoys sea views and far reaching rural views (St Michael's Mount can be seen from the garden). We are half a mile from the A30 which connects to all main roads of West Cornwall. We are near local interesting towns, villages, harbours and beaches. There is parking for 4 cars and the building is completely self-contained on a half acre site. There is a large well-established, relaxing garden. Where we live is a perfect base for all West Cornwall beaches and attractions including Carbis Bay, Newlyn, Mousehall, The Minack Theatre, Falmouth & The Eden Project,. Praa Sands, Helston. Lands End and Sennon. Golf: Lelant is the nearest. Several other full size golf clubs nearby. Ski: Dry ski slope in Plymouth. The above prices are for up to 2 people staying. There is a £10 Supplement per night if a third person stays. We may offer Short Breaks if we have Late Availability, and at our discretion. Please enquire.